Gone fishing…Not From a Box style, that is. 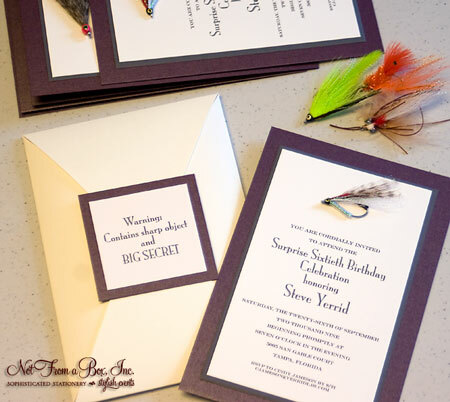 So what kind of invitation do we design for the milestone birthday of an an avid saltwater angler, philanthropist, and prominent businessman? Oh, and the party is a surprise? Boy, did we have fun with this one. 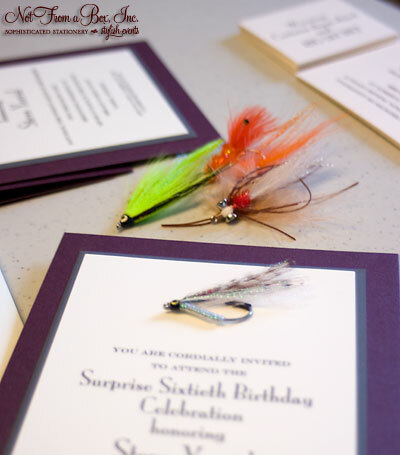 The first phone call I made was to another experienced saltwater fisherman (my husband James) to find out the right type of fly lure to mount on the top of the invitation. We can’t put a freshwater fly lure on a saltwater fisherman’s invitation now can we? I’m all about the details, folks. After some strange looks, then genuine enthusiasm from the folks at the local tackle shop, I found myself with more than a hundred of the coolest invitation embellishment ever. They had feathers, sparkles, glitter even! Wait…those pretty flys also have a really sharp hook. Yikes. We better wrap the sharp edge so nobody gets hurt. And just for some extra CYA (the birthday boy is an attorney after all) let’s put a warning label on it too. Here’s the complete ensemble. This goes down as one of my all-time favorites. This soiree was planned by Brooke Palmer at RSBP Events. We’re quite sure it was a fabulous night, and we anxiously await the pictures. This entry was posted on September 28, 2009 at 1:04 pm and is filed under Real Weddings & Events. You can follow any responses to this entry through the RSS 2.0 feed. You can leave a response, or trackback from your own site.